Every Lassco corner rounder comes equipped with your choice of one standard size interchangeable cutting unit. Use only one piece of equipment to create perfectly rounded corners on all your documents, regardless of their size. The 1/8" cutting unit is designed for rounding corners on business cards, while the 3/8" cutting unit ensures perfectly rounded corners on letter size stock. 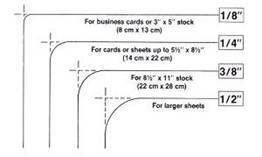 Specialty and large size cutting units are also available for those custom corner rounding jobs. Not sure which size cutting unit will best meet your needs? Contact a Factory Express corner rounder expert at 1-800-399-2564, today!